The Merrill Christine Pre and Jens Phono Bring The Bling! 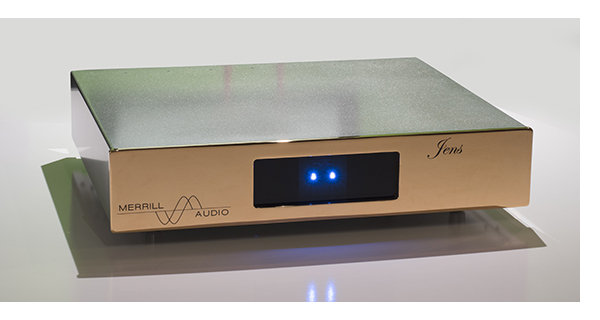 The good news is that both the Merrill Audio Christine linestage and the Jens phonostage are two world class components, revealing a tremendous amount of music, while leaving no sonic signature of their own. 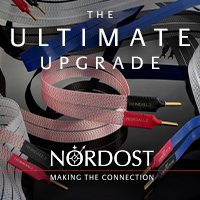 No small feat for any linestage or preamplifier at any price. Considering that the Christine tips the scale at $13,000 and the Jens at $15,500, you might even consider them a bargain. That will depend on your meal plan. Listening begins with the Christine Reference linestage to get familiar with the Merrill Audio “sound,” or in this case a complete lack thereof. 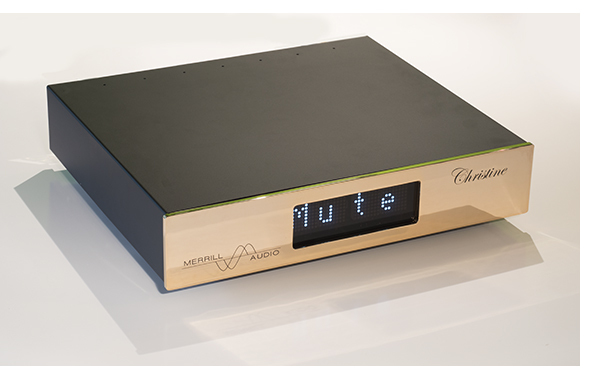 The Christine Reference Preamplifier belongs on the ledger with the $40,000 Robert Koda K-10 for delivering a neutral presentation in every way. It sounds like neither tubes nor solid state, it is merely a conduit for music. Talking to Merrill Wettasinghe, the designer, he stresses the wide bandwidth of this preamplifier as part of it’s neutrality and it only takes a cursory listen to realize he’s on to something. 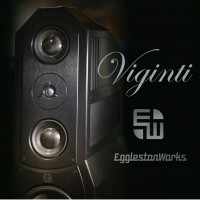 Queuing up Mickey Hart’s Drumming at the Edge, a real audible stunner, both for micro dynamics and dramatic bass drive instantly hammers home the capabilities of this preamplifier. The instantaneous nature of Hart’s big bass drums is engulfing, giving the Quads a level of sock that doesn’t happen easily, yet when fast forwarding a few tracks to “Lonesome Hero,” you can hear the beads flowing back and forth in their stick, and you’re waiting for Hart to hand it to you from inside one of the speakers like the ghost in Poltergeist about to pop out of the television set. Moving on to “Mali Men” from Afel Bocoum and Alkibar, with it’s dueling acoustic guitars, the lightning speed of this preamp takes charge, revealing every nuance of the fretboard action, to the point where through the Quad 2812s, it’s as if you are sitting right in front of these guys feeling their fingers zoom up and down the fretboard. Saying that the Christine conveys the emotion of the performance doesn’t do this box justice. 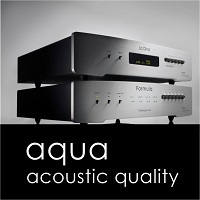 Much fun as this preamplifier is with the Quads, (and they’ve turned in a breathtaking musical performance with the Christine) moving to the GamuT RS5i’s and the Focal Sopra no.3’s, both of which have some serious bass output, further illustrates the speed, precision and articulation of this incredible linestage. If you want bass grip, you’ve got it. 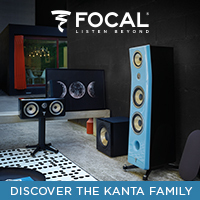 The deep, slippery bass groove in Thomas Dolby’s “Pulp Culture” hits hard through the Focals, and these speakers which share the Grande Utopia’s ability to nail percussion transients do an incredible job at painting a distinctly multilayered portrait of this and many other highly familiar recordings. Even relatively blasé recordings like the Monkees self titled album reveal hidden treasure. Granted, the Christine shows off the somewhat low fi recording, it still digs up a plethora of detail, not only showcasing the delicate harmonies in the arrangements, but keeping the bass line intact and powerful. I don’t think I’ve ever heard “Last Train to Clarksville” sound more engaging. 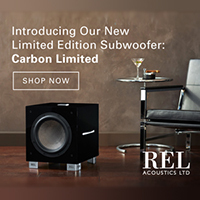 Vocal and acoustic instrument aficionados will not be disappointed either. However, extended listening sessions reveal that while this linestage is tonally neutral and incredibly true to the music, it does not embellish in the least. Fortunately, it is not forward, etched or strident in any way, yet it will not make magic out of lousy recordings. So the final choice will be up to whether you want to play it as straight as it gets, or do you want special sauce? Magical presentation aside, this is probably one of the more difficult preamplifiers I’ve used. Nothing about the Christine is intuitive and while the manual is nearly 50 pages, you don’t even get to how to turn the damn thing on until page 24. Once you’ve paired the supplied Apple Remote and waded through a few menu layers, you will be rewarded with incredible sonics. Christine should be better accessorized for 13 grand. However, Mr. Wettasinghe has spent the money where it counts, on top of the line Cardas XLR connectors throughout. 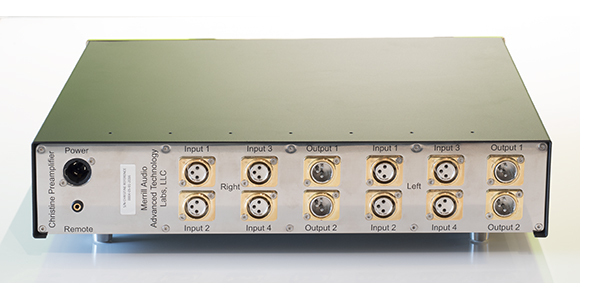 This is a fully balanced preamplifier, though it is supplied with two pairs (one for output, one for input) of Cardas premium XLR adaptors too. Always the mark of an excellent design, the Christine performs equally well mated to balanced or single ended components, so don’t shy away from it if the rest of your gear is adorned in RCA jacks. Aesthetically, the shiny gold plated front panel will appeal to you or it won’t. Should you purchase the matching Jens phonostage, you will at least have two components that visually complement each other. The alphanumeric display screams Apollo 13, however it is easily read from across the room. Whether this will cloud your judgement and subsequent purchase decision is up to you. We have no idea what’s inside the case of these solid-state miracles, as Wettasinghe does not talk about it or publish pictures. 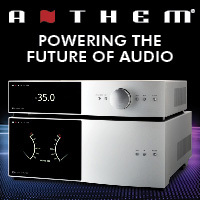 This preamplifier is a two-box design, with a smaller, external power supply attached via a supplied umbilical cord, which is also of very high quality. Should you buy one and open it up to peek for yourself, the warranty is void. As Tom Waits would say, “What’s he building in there?” Proprietary anything makes me suspicious and crabby at the same time, but the damn thing delivers. My K-10 is the same way. Shrouded in secrecy. We’ll never know. The $15,500 Jens Reference phonostage is equally compelling. Sharing a similar lack on sonic signature with the Christine Reference linestage, the two together are a powerful combination. Fast, full range, and audibly engulfing. Oddly, for as much as Mr. Wettasinghe carries on about the benefits of a fully balanced topology, the Jens is single ended, with a single input and single output. No matter, the delicacy of Eric Bibb’s guitar comes through strongly, striking a great balance of brushwork on the drums with Bibb’s plucky guitar style. His recent release from Pure Pleasure Analog is absolutely sublime. Partnered with the Koetsu Onyx Platinum, the Jens reveals a lot of music, taking you to a place I’ll stick my neck out and guess you haven’t been. Gain is fixed at 70db, which works well with every cartridge in my collection, especially with said Koetsu, having only .3mv of output. Loading is widely variable from 5 ohms to 5,000 ohms, which should accommodate a wide range of cartridges, especially with the range between 25 and 500 offering the bulk of the settings. Where the loading functionality of the Jens Reference Phono stage is incredibly well thought out, implementation is not terribly user friendly. That big lighted panel on the front face merely has three sets of LEDs indicating the Jens’ power up status. 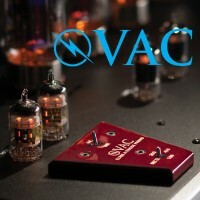 Adjusting gain requires going back behind the preamplifier, and rotating a pair of black knobs, hoping you’ve set the same number of clicks on each channel. If you are an analog lover that changes cartridges often, this will become tiresome in a hurry. In all fairness, we didn’t knock the $60,000 Indigo Qualia for having one input and a single gain/loading setting, so we won’t knock the Jens for the same failing. 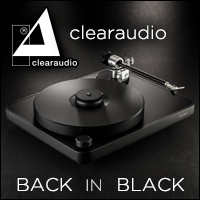 Simaudio’s MOON LP810 also only sports a single input and is similarly priced to the Merrill Audio. So consider this a high performance phonostage for the music lover with a single turntable that doesn’t swap cartridges often. If you like to diddle with multiple table/arm/cart combinations, you might be best served elsewhere. Again, like the Christine, the Jens is sealed, with an equal penalty (i.e. 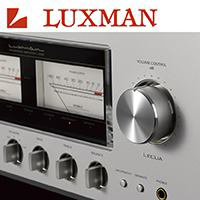 no warranty) so there is no way to see just what lurks underneath the cover and how the build quality of this preamplifier stacks up to its competitors. 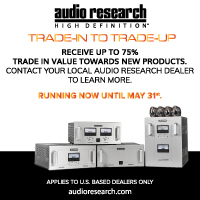 It uses the same two box design, utilizing the same power supply as the Christine Reference Pre, so if you decide to go all Merrill Audio, the line and phono stages will require three shelves to accommodate all of the boxes. Combining the Jens with the Christine makes for a dynamic combination. 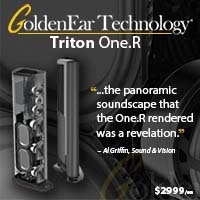 Both share the same ultra wide bandwidth design ethos and provide a very fast, clear and immediate presentation. 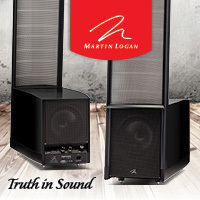 Even the notoriously forward Rega Apheta 2, thanks to a 25 ohm loading setting is easily tamed, providing linear response. While there is no listed specification for signal to noise ratio, the Jens has a complete absence of background noise; it’s high res digital quiet, making for an incredibly dynamic analog presentation. All the audiophile cliché’s about “inky black backgrounds,” and “sound just creeping up out of the background,” etc., etc., apply here. Most phonostages have at least a tiny bit of noise, but not this one. Even with the volume control of the Christine cranked fully clockwise, there’s a total absence of sound. Impressive. The Jens’ lack of sonic signature doesn’t really make for exciting audio journalism. Extended listening with a wide range of highly familiar pressings proves highly engaging. 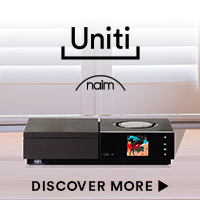 A perfect tonal balance, wide dynamic range and weighty presentation gradually increases the gravitational pull of your listening area. A few hours on the couch with the Jens makes it tough to escape your hifi system’s orbit. 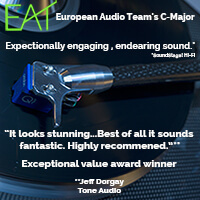 As more hours racked up, the same thought occurs when listening to the Jens, it epitomizes the analog feel, giving recordings this homogenous flow resembling a master tape that helps fool your brain into thinking you are listening to the real thing. And the more you listen, the more you’ll be pulled in. Everything feels a little bigger, a little deeper than what you’re probably used to. 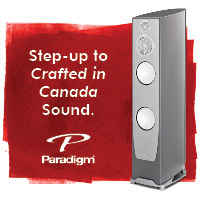 The only phonostages that have exceeded this have been the $60k Qualia and the $65k Pass Xs Phono. I’ve yet to experience a phonostage that reveals this much music at this price, and that’s the highest compliment I can pay the Jens. A few other phonostages do things differently, a few are more user friendly and a couple of great tube phonostages offer their own sonic signature that one listener may prefer over another. But if you want analog honesty and you don’t mind the quirky nature of the Jens, I can think of no better phonostage unless you’ve got $60-65k to spend.